Predicting in the preseason who will be in the running for College Football’s greatest individual accolade can be, depending on the year, extremely difficult or a walk in the park. Today, we’re going to look at who I think are the deepest of dark horse candidates for the Heisman trophy. Justin Herbert, QB, Oregon – A key reason for many players winning the Heisman is the MVP factor they bring to their respective team, and Justin Herbert is a key example of that type of player. Herbert, a junior for the Ducks, makes Oregon tick. When he wasn’t out with a broken collarbone last season, the Ducks’ offense thrived. Herbert put up a 6-2 record as the starter and managed to pass for 1,983 yards and 15 touchdowns in those 8 games. However, when he was sidelined, Oregon managed more than 14 points and won only once in five games when looking to one of his backups. Even though Willie Taggart left to take the helm at Florida State, a lack of offensive continuity shouldn’t be an issue, with last year’s offensive coordinator Mario Cristobal getting promoted to head coach in the offseason. The loss of veteran running back Royce Freeman to graduation (a Heisman contender as well last season) will also mean more touches should go to the experienced hand in Herbert, which bodes well for his chances. Rashan Gary, DE, Michigan – The athletic freak that is Rashan Gary is getting more looks as a mouth-watering NFL talent than a college awards candidate. I believe most of that comes down to playing opposite of the slightly overhyped Nick Bosa in the Ohio State-Michigan rivalry. Nevertheless, Gary has been named to the Chuck Bednarik Award watch list, which goes to the nation’s best defensive player, after last season’s stat line of 66 tackles and 12 tackles for loss. Playing in multiple national spotlight games this year and having two all-Big Ten linebackers in the same squad as him in Khaleke Hudson and Devin Bush (who are also on the Bednarik watch list and could probably be on this list as well) bodes well for Gary’s chances of being a defensive contender for the Heisman trophy. 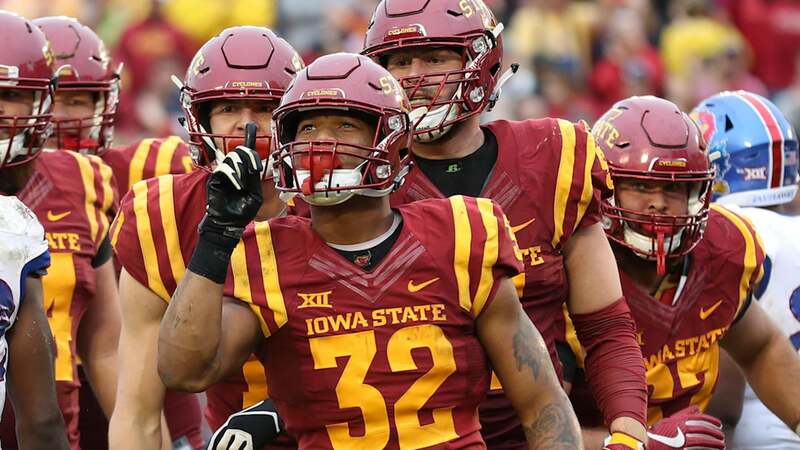 David Montgomery, RB, Iowa State – Sometimes, schools spring up with Heisman candidates out of nowhere, and Iowa State has one in its workhorse of a running back, David Montgomery. Although he doesn’t get the national attention he deserves playing for ISU, that didn’t stop Montgomery from rushing for 1,146 yards as a sophomore in 2017. The Cyclones’ breakout 8-5 season was highlighted by Montgomery and his near perfect record toting the rock. His only fumble came on a questionable call on a review during the Liberty Bowl. Montgomery can beat teams with speed or by running over defenders and breaking arm tackles, and he is sure to do more of the same this season in an offensively stacked Big 12 conference. Penny Hart, WR, Georgia State – He may be 5-feet 8-inches tall and play in the Sun Belt conference, but Penny Hart’s game is bigger than that. Hart leads all active FBS wideouts in career receiving yardage with 2,291 yards, and he’s only played two seasons for the Panthers. Being one of Georgia State’s lone offensive threats will allow defenses to key in on Hart, but another season of big-time production could lead to some national attention and trophy talk for the diminutive but capable junior. Benny Snell Jr., RB, Kentucky – It’s tough to break through as a player if you aren’t playing for a year-in-year-out power in the top-heavy SEC, but occasionally a stud like Benny Snell Jr. can find the space to shine. Snell Jr., a 5-foot 11-inch junior, returns for the Wildcats after posting 1,333 yards on 262 attempts last season. He finished behind only Nick Chubb and Kerryon Johnson in the yardage category (both of whom are gone to the NFL). Now, Kentucky needs to replace its quarterback, and having the stability in the backfield with Snell Jr. (along with four returning starters on the offensive line) means Snell will probably get an even larger workload this season. I think that bodes well for his Heisman hopes. Nathan Rourke, QB, Ohio – Nathan Rourke didn’t enter the 2017 season as the starter, but once he had taken over the job, he played like a returning fifth-year senior, despite just being a sophomore. Now, going into his junior season, Rourke and the Ohio offense will look to improve upon last season and his ridiculous numbers, specifically on the ground. Rourke rushed for 912 yards and a school-record 21 touchdowns while also throwing for 2,203 passing yards and 17 touchdowns. The Bobcat offense is nearly unchanged from last year, so Ohio should figure to make a run for MAC supremacy while Rourke goes for individual glory. Next: Next post: Why Doesn’t The World Know Who Mike Trout is?